My daughter loves absolutely anything having to do with princesses. Her play dates with friends are essentially two hour dress up sessions as they change from one Disney dress into another. She won't let me touch her hair with a brush unless we're doing her hair into Princess Anna or Queen Elsa braids. And, when we go to the library, she is exclusively interested in books having to do with royalty. Which is how I discovered how many terrible, tedious, and thoroughly mediocre books there are in this genre. To save my own sanity, I've been hunting for picture books that are clever, beautiful, and engaging- as all picture books should be- even though they are about princesses. Today we are sharing a few of our favorites. (There are also so many wonderful versions of Cinderella, here are ten of our very favorites) To anyone with a daughter under the age of 8, you're welcome. 1. 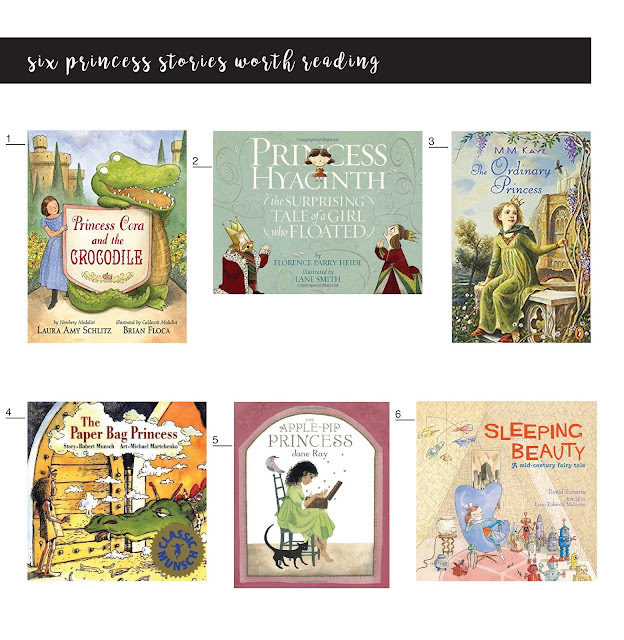 Princess Cora and the Crocodile: Released last year, this tale (written by Newbery Medal winner Laura Amy Schlitz and illustrated by Caldecott Honor winner Brian Floca) is delightfully different. Princess Cora leads an extremely structured and dull life until she and her pet reptile switch places for a day. Chaos ensues and life at the castle will never, thankfully, be the same. In addition to being a fun read, it's also beautifully illustrated- and at $8 for a hardcover is a steal on Amazon. 2. Princess Hyacinth (The Surprising Tale of a Girl Who Floated): Princess Hyacinth has an unusual name, and an unusual problem. She spends her days weighed down, figuratively and literally, until she finds the freedom she seeks, and an unexpected friend saves the day when things go slightly awry. 3. The Ordinary Princess: This is the story of a princess who, though born looking and acting exactly as a princess should, is given the extraordinary and unexpected gift of becoming ordinary at her christening. How she escapes the confines of the castle and then returns on her own terms is an adventure that I absolutely loved as a child. The ordinary princess was more appealing to me than all the Disney princesses put together. Please note that this is a chapter rather than picture book, but it makes for a wonderful read aloud. 4. The Paper Bag Princess: This one is a classic. If you haven't read it yet, you need to, there's a reason the NYT has called it one of the best children's books every written. Ahead of its time, author Robert Munsch turns the traditional rescue of the fair maiden on its head and gives his readers a feisty heroine worth cheering for. The ending is my favorite. 5. The Apple Pip Princess: This book is sadly out of print, but I loved the thoughtful and original protagonist. After the queen passes away, the once beautiful and vibrant kingdom becomes hopeless and barren. When the king charges his three daughter with creating something meaningful to determine who will inherit the throne, Serenity finds a way to bring new life into her kingdom and restore lost hope. The illustrations are as beautiful as the story. 6. Sleeping Beauty: A Mid-Century Fairy Tale: The inimitable David Roberts has partnered with his sister Lynn to re-imagine several classic fairy tales. Set in the 1950's, their fourth collaboration, Sleeping Beauty, features an all female cast and David Roberts' brilliant retro illustrations on every page. Need I say more? This site has stores of favored point of view. I found different dazzling things from this site. It causes me from various perspectives. An obligation of appreciation is all together to post this once again.